Pastry 155g plain flour 85g unsalted cold butter, diced 40g icing sugar 1/2 egg yolk 1 1/2 tablespoons milk Half a lemon, zest only For egg wash, use the remaining egg yolk with a drop of boiling water. Filling (this is for a small heart tin) 100g strawberries, hulled and chopped 100g cherries, stoned and quartered 1 tablespoon caster sugar, sifted 1/2 lemon, juice only. Cream to serve. Vanilla bean paste (optional) Method Prepare your baking tin if necessary (not requires if using a trusted non-stick tin) Rub in the butter to the flour, either by hand or mixer until it resembles fine breadcrumbs. Add the icing sugar and the lemon zest and mix to combine. Add the egg yolk and milk gently mixing until it all comes togther as a dough. Flatten to a flat disc, wrap in clingfilm and put in the fridge to chill and rest for the minimum of an hour. In the meantime prepare the fruit. Wash, hull and stone the fruit. Cut in to pieces appropriate for the pie tin that you are using. Sprinkle over the sugar and squeeze in the lemon juice, stir and allow to macerate for 30 minutes. Take the pastry out of the fridge and roll out between 2 sheets of silicone baking paper. Roll out thinly then line your chosen tin. Gently push the pastry in to the edges to fit nicely, leave an over hanging edge. Place the remaining pastry and the lined tin back in to the fridge for another 30 minutes. Preheat the oven to 180c Fan. Line your chilled prepared pastry tin with silicone baking paper and fill with baking beans, place in the preheated oven and bake for 10 minutes. Carefully remove the beans and paper, then place back in the oven for a further 5 minutes. Remove once more and brush with the pastry with egg wash. Return to the oven until golden and crisp. Allow to cool then trim off the excess pastry. I use a speed peeler which prevents any breakage. Fill with the macerated fruit (you may have more than required). 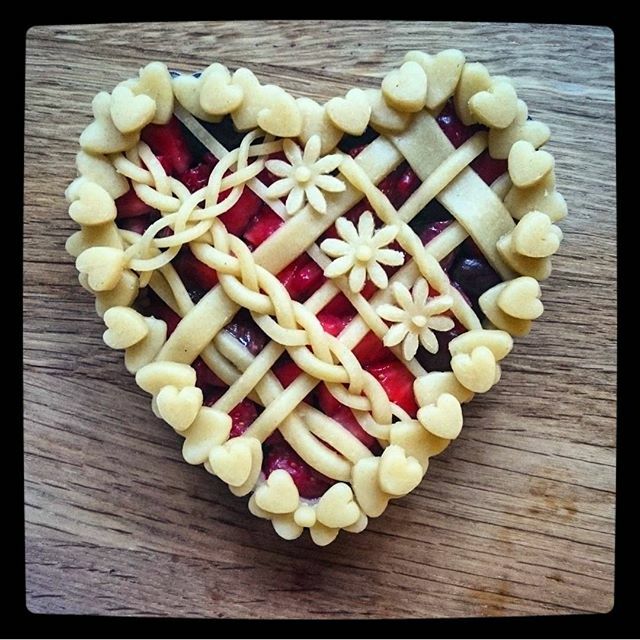 Use the remaining pastry to decorate the pie with cut outs, braids and lattices. Gently egg wash the pastry topping and bake until golden then allow to cool. Serve with cream of your choice, whether pouring or lightly whipped, adding some vanilla if desired.